For Valentines Day, I got a new waffle maker. I have been without a waffle maker for more than ten years, and didn’t think that I was really missing out on anything. Waffles are just glorified, more-effort-involved pancakes, right? I was so wrong! So I must thank my kids for conspiring to get me this new waffle iron! I love it! I do have to admit that Little J was leery of the first waffles that I made. “These are burnt. And square.” she said. I replied that they weren’t burnt; they were supposed to be that color. She insisted, however, that “real waffles are supposed to be yellow. And round.” (Think Eggo). Poor child: she had never eaten a homemade waffle, only an artificially colored imitation. I am glad to say that after her first bite, she was converted. She is still less convinced about the homemade syrups. She keeps asking when I am going to buy some more “real syrup.” Until then she is sticking to fruit and whipped cream toppings. 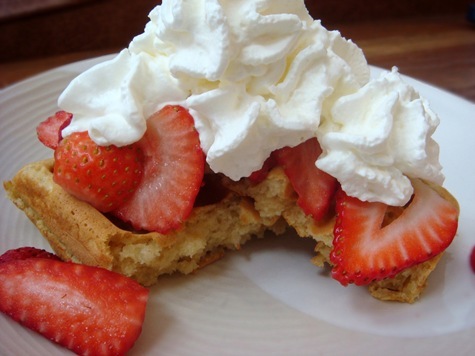 For the last couple of months, I have tried more than a dozen new waffle recipes (and some great waffle toppings), and I am finally ready to share some family favorites. The first recipe is a traditional buttermilk waffle recipe, made with separated eggs (with the egg whites beaten until stiff). The whipped egg whites make for great air pockets in these crispy waffles with a soft, tender center. This is a great basic recipe for everyday waffles. Make sure that your waffle iron is very hot. Cool iron = lots of sticking. My new Calphalon waffle iron is non-stick and does not require any oil or spray to keep the waffles from sticking. Don’t overfill the waffle maker pockets. Spillage is not fun to clean. Start with a scant amount of batter on the first few waffles, until you are sure of the right amount. Different recipes will rise more or less while cooking, so don’t think that the same amount of batter will work with different recipes. Once your batter is mixed, do not keep stirring batter between batches. The air pockets in the batter (from the baking powder/soda or whipped egg whites) will collapse with over-stirring. Use a ladle or measuring cup (1/2 cup size works well for my waffle maker) to scoop batter. This minimizes the stirring or pouring which will deflate your batter. If you are using add-ins like blueberries or chocolate chips, sprinkle them on the batter in the waffle iron (instead of in the batter in the bowl); then use a heat-safe rubber spatula (or the back of your ladle) to move some batter over the berries/chips so that they don’t stick to the top plate of the waffle maker. If stirred into the batter in the bowl, these heavier items tend to sink, requiring more stirring, which will deflate your batter. Cool waffles on a wire cookie sheet, not a plate. Letting the air circulate around the waffles will keep them from getting soggy. If you are not serving the waffles immediately, place the wire cooling rack in a warm oven (200°F or lower) until ready to serve. Waffles are great for making in large batches and freezing in Ziploc bags for busy mornings. Reheat in the toaster to maintain crispy edges. Buttermilk substitute: Place 1 Tbs lemon juice in a one cup measure; add milk to one cup line. Stir; let sit for 5-10 minutes before using. Or try dried buttermilk powder that stores in the fridge. Or use kefir. Oil (in the batter) makes for crispier waffles; melted butter makes for softer, more cake-like waffles. I prefer using oil in most recipes. Use a mild flavored oil. In a large bowl, combine flour, salt and baking soda. In a separate bowl, combine buttermilk, brown sugar, oil or melted butter, vanilla and egg yolks. Mix well. Using an electric mixer, beat egg whites until they form soft peaks. Stir buttermilk mixture into dry ingredients. Gently fold beaten egg whites into batter. **To make sour milk: add 2 Tbs lemon juice to a 2 cup measuring cup, fill to 1 ¾ cup line with milk (whole milk works best). Stir; let sit 5 minutes before using. If using sour milk, add an additional 1-2 Tbs flour to batter. I’m a pancake person, but these look too good. I’ll have to give them a try this weekend! Thanks for the waffle tips.